Stfo w/ ya book readin wordz hatah! A wholly remarkable encyclopaedia whose title often floats amongst the stars. The Hitchhiker's Guide to the Galaxy is a wholly remarkable encyclopaedia of all worldly knowledge, conceived by an ape who thought digital watches were a pretty neat idea. However, in recent years it has been overshadowed by various tie-in material, including a BBC Radio 4 show, a computer game, a book series, a TV series, a graphic novel series, and a series of towels, and now happens to be ruling over the small backward planet in the unfashionable end of the milky way galaxy, aka Earth. The actual guide is a great deal more impressive than these works, what with being a guide to the entire Milky Way. 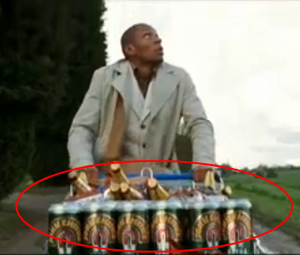 A typical researcher for the Guide, in this case "researching" a cart of finest Beer. Douglas Adams initially conceived of the idea while drunk. Lying in a field in Innsbruck with his copy of The Hitch-hiker's Guide to Europe and gazing into the starry sky, he realised that writing a Hitchhiker's Guide to the Galaxy would be a zarking great idea. Not only was he grateful for not having to carry around such a book, which would be so incredibly heavy in print, but also he was grateful that someone in the history of the human race was actually able to come up with a worthwhile idea while drunk. This would, in fact, be the only incident of its kind in the history of the universe. Conceived as an electronic guide to the entire galaxy, the Guide was realised by Megadodo Publications of Ursa Minor Beta. While Megadodo's staff originally drew up a 10-month plan to finish the Guide, they had not considered the fact that life did, in fact, exist beyond their backyard. When this fact was discovered after eight months of careful cataloguing of various species of earthworms, the staff decided to build a galaxy-wide network, the Sub-Etha Net, through which it could recruit "researchers" and receive their entries. Within a month, the Guide grew exponentially in information. The new plan was not only highly efficient, but also highly profitable for Megadodo's staff. They were absolved of any obligation for their information to be actual; their costs decreased exponentially; and they could have astronomically long lunch breaks. The publication's history, however, did not finish at this juncture. Even after this new plan was hatched and completed, the Hitchhiker's Guide to the Galaxy underwent major revolutionary changes mainly designed to barely justify exorbitant pricing. Perhaps most recognisable and even helpful—a trait uncommon in technologies—was the voicing of the Guide's innumerable entries. This complaint was made after customers realised that were they intently reading an entry on, for instance, the Ravenous Bugblatter Beast of Traal, then their probability of being killed by said Beast increased exponentially. Intently listening to someone tell the entry to you, while it does not change anything with regards to how much danger the user is in, is a far more pleasant way to endanger oneself. This voice was conceived as a "Peter Jones-y" sort of voice—sonorous and genial. In their quest to find such a voice, the casting crew searched through dozens of actors—Michael Palin included—they finally zeroed in on one particular actor: Peter Jones. A spyshot of the Guide's tablet-like form factor. The designer of this bright colour scheme used on-screen is currently being considered for imprisonment. Another element that has changed over the years is the elimination of an alphabetical index and keyboard. Instead, recent revisions of the Guide have started to embrace the tablet form factor as it has eliminated the keyboard entirely in favour of a screen and voice recognition software almost entirely replacing any buttons. This sort of form factor, as we all know, will never catch on. To market the Guide, Megadodo Publications have in turn commissioned Douglas Adams to create a great deal of tie-in media. Much of this has ended up overshadowing the Guide itself, now dismissed as the stuff of science fiction. The tie-in campaigns include a radio series, a book series, a TV series, a movie adaptation, a series of towels, and a tie-in website with practically the same idea as the Guide itself, except with even less verifiability. Except for this website, much of the material is pure fiction, focusing on a researcher for the Guide, alias Ford Prefect, who is a Betelgeusian stranded on Earth with no way out. Intended to be a glorification of working for the Guide, the series fail miserably in their original purpose. Zaphod Beeblebrox, President of the Galaxy. Despite popular belief, he is essentially real, much to his joy and everyone else's chagrin. How exactly they come to arrive at Magrathea and what happens afterwards depends on which adaptation of the series one believes. None of them are exactly "canon", and all versions of the story are equally convoluted random drivel. The radio programmes were the original version of the Hitchhiker's saga. The Primary Phase was broadcast in six "Fits" on BBC Radio 4; the episodes were named "Fits" due to the fact that John Lloyd would have a fit every broadcast as he realised how much of his stuff Douglas Adams had utterly ignored. 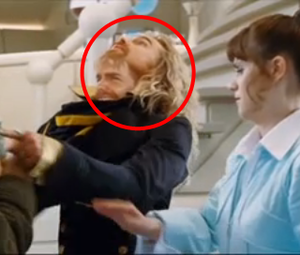 Numerous gags were written especially for radio, such as Beeblebrox's second head and third arm, which existed only in highly messed-up urban legends. The BBC, sensing that Hitchhiker's could be an amazingly spectacular profit machine, immediately commissioned a television series to air on BBC Two, retaining most of the radio cast. At this point, Adams knew he would have to pay for making up jokes about two-headed, three-armed aliens—something highly complicated to show on television. However, the production crew outdid their objectives; not only did Wing-Davey have an animatronic head and a fake arm, but his costume indicated the presence of two sets of reproductive organs, a highly, highly messed-up urban legend. Although a second series never materialised, Red Dwarf was arguably the same exact thing, except even sillier—a feat that defies all logic when Hitchhiker's had Ford Prefect turning into a penguin, but nonetheless one that was thoroughly accomplished. The TV series was followed by an interactive fiction game from Infocom, designed in part by Adams. The game was famous for being as convoluted as the radio series, and, because of its difficulty, was wildly popular. Another fine, overly dangerous product of the Sirius Cybernetics Corporation. A rubbish film version was finally completed after Adams's death, by a nation that doesn't understand irony. A non starter for a film like this, really. 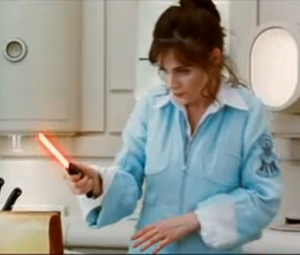 The film, in atypical fashion for the franchise, was full of standard Hollywood clichés, with big musical numbers, pointless action sequences, and cheesy over-the-top Disney moments. Needless to say, it clearly must have been a parody of Hollywood rather than a victim, because nothing in this franchise could ever be unintentionally that bad. 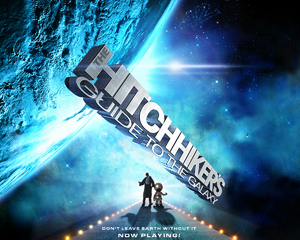 The Hitchhiker's Guide is today an international phenomenon with lasting cultural impact. Its treatises on towels, digital watches, and the stupidity of humankind as a whole have been widely cited. The saga also helped reinforce the stereotypical Englishman's obsession with tea and relationship with bureaucracy. Asteroids have been named after Arthur Dent and Douglas Adams, and Hitchhiker's fans are obsessed enough to dare to select May 25—the release date of Star Wars—as "Towel Day". It is highly unfortunate, then, that such an influential story of the 20th century should not—and likely never will—have a serious film adaptation. This page was last edited on 1 December 2017, at 21:58.